American picked up its third Patriot League win at Army. Here are five key plays/sequences from the game. Lonnie had a big first half with 10 points, two rebounds, a steal and an assist. It was the beginning of a nice bounce-back game for the sophomore who played 30 minutes — 23 more than he did vs. BU. Some of them were forced — see Alex Paquin get a hand on the ball here — and many of them were unforced, but Army was a turnover machine as American took the lead late in the first half en route to a 30-26 halftime lead. Army finished with 21 giveaways. About midway through the second half, Army's wing John Emezie took over. He scored six of eight Army points at the rim to get the Black Knights back within three, 44-41. 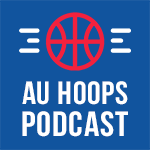 As their careers wind down, each game means even more to AU's seniors Charlie Jones and Jalen Rhea. Both guys made huge plays late to seal the win over Army. Charlie capped off another great all-around performance — 13 points, seven rebounds, two steals, two assists — with a late steal and then four free throws in the last minute. Jalen hit the biggest shot of the afternoon, making a 3 from the corner, his favorite spot. Delante Jones had a chance to seal the victory, but he missed two free throws with 13.2 seconds left. After a timeout with four seconds left, Army's Tommy Funk had a look over Sa'eed Nelson, but it glanced harmlessly off the rim. There was no way American would try fouling intentionally — a type of late-game strategy coach Mike Brennan has admitted the team isn't ready for — and Funk had a decent chance at tying the game, but the Eagles escaped.